(June 20, 1847, 170 years ago): Williams County’s first recorded murder occurred when Daniel Heckerthorn killed five-year-old David Schamp in Jefferson Township. The plan unraveled when Heckerthorn confessed to the murder and implicated Tyler. Tyler was executed in Williams County’s only public hanging on the north side of Bryan’s courthouse square in January 1849. Heckerthorn was also sentenced to hang, but his sentence was commuted to life imprisonment at the Ohio Penitentiary. In November 1860, Heckerthorn was pardoned and released from prison. Local records on Heckerthorn end with his pardon; the place and date of his death are unknown. 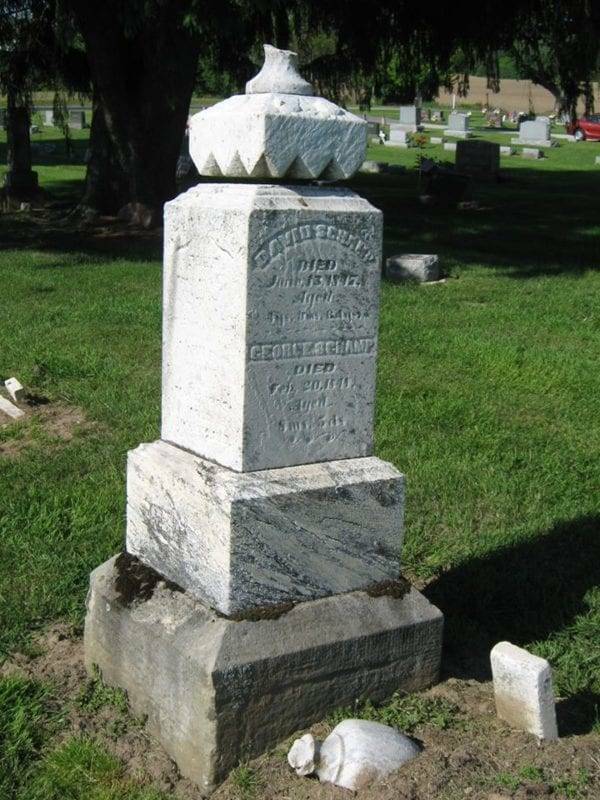 This May 23, 2015, photograph of David Schamp’s grave marker at Floral Grove Cemetery near West Unity is from the Kevin Maynard collection–Courtesy of the Williams County, Ohio, Local History Exchange. Be the first to comment on "(1847) – Williams County’s First Recorded Murder (Jefferson Township)"